In November 2011, I took on the role of Marketing Director for Steve Jackson Games. I telecommute, which helps me get a lot more done than I would if I was down in Austin. I recently spent a week down there and talked about my trip when I returned from Austin on my blog. The experience reminded me of working for a restaurant or a newspaper because everything hinges upon product getting out the door in a timely fashion. For a small company with a big reputation, day-to-day operations can get pretty crazy especially when we’ve got a lot of new staff. Due to promotions and shifting positions, Leonard Balsera of Evil Hat Productions fame is now the new Munchkin Hireling. Angie, the former assistant, is now in Warehouse 23 customer service rep and Liegh, who was Phil Reed’s assistant, got promoted to Warehouse 23 manager. We’ve also got a new person at the head of MIB Control and in charge of convention planning. Kevin is way, way, way more organized than I could ever hope to be! Warehouse 23 is an online store where you can buy games and toys from a variety of publishers — including Steve Jackson Games. It is the sister store to the digital arm dubbed e23. For Valentine’s Day, the Sparkly Good Fairy dropped by the warehouse. The Official Munchkin Bookmark of Sparkly Good Monster Mayhem will be included with each order while supplies last. Customers who place an order of $75 or more will also get a Munchkin Fairy Dust Handbag of Holding, too! There are some items on Warehouse 23 that you can’t buy anywhere else. 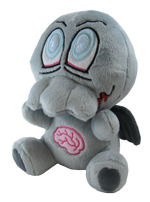 If you’ve never checked out this store before, I’d definitely take a peek at the Warehouse 23 exclusives for some Cthulhu-licious options. I was happy we could put together this promotion because I’ve been learning how dedicated Munchkin fans are to this game line. To give you a hint? One rare Heart of the Anomaly Munchkin card was sold for over $1,000 dollars on eBay! My goal is to figure out how we can get promo cards and bookmarks out to fans. We’ve got a lot of ideas brewing that have to be balanced against convention season and getting new games and toys out the door. Did you know that Munchkin is now in Target? Yeah, pretty exciting stuff. Several fans are eagerly awaiting the debut of the Plush Tentacle. It’s bendable and it has a belt loop, too. 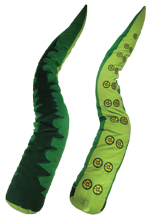 I’ve already heard some folks are planning on incorporating the tentacle into their Halloween costumes. I’ve also been preparing for a few big releases this quarter. Munchkin 8 – Half Horse, Will Travel, which was drawn by John Kovalic, has two new fantasy races in the supplement to core Munchkin. Now, if you’ve been following John’s art from the beginning, you will notice a huge difference in the line art. The cards a lot more detailed due to his style enhancements. The Good, the Bad, and the Munchkin 2 – Beating a Dead Horse is the second expansion to come out this spring followed by Munchkin the Guild. Len Peralta, who draws the Geek-A-Week cards, is the artist for the Munchkin the Guild booster. The other new release I want to mention is the Zombie Dice expansion dubbed Zombie Dice 2 – Double Feature. I haven’t played the alternative versions yet, so I’m anxious to see what they came up with. Zombie Dice has turned out to be a fun game when we’re entertaining folks. My brother loved it! I’m not sure if you’ve had the chance to check out what was released in 2011 from Steve Jackson Games, but I have two lists for you just in case. First, you’ll want to check out the GURPS releases in 2011 which includes GURPS Horror by Kenneth Hite. The cover was illustrated by Chris Shy, who has done a lot of work for White Wolf Publishing and other game, movie, and comic companies. Second, be sure to read the 2011 Steve Jackson Games release list to get a feel for what came out last year. Cthulhu Week and Contest at FlamesRising.com! Ia, Ia!